I thought it would be funny to hear from other people about the colossal mistakes they have made on previous jobs or projects. I have a couple, but I will share this one first. So, I had been doing art gallery work for a couple of years as an art installation installer and general cleanup and preparation around the museum or gallery. One of the gallery directors liked the work I was doing and so started throwing me some side jobs. One of them involves building a crate for a painting that had to be shipped across the country to another gallery. I had never built a crate before but it looked very simple so I took the job. The painting itself wasn't that big Maybe 3 feet by 4 ft. So I got to work assembled all the materials and built the crate over the weekend. Problem was I decided to use three quarter inch plywood and two by fours not realizing that the standard for this sort of light work was quarter inch or even five milimeter ply and 1x pine. So by the time I was done the crate weigjed well over a 150 pounds and was very unwieldy because I had put all of this extra space in it for foam inserts and such. Furtyermore the painting needed to get out Monday morning and I realized Sunday night that I'd forgotten to get some cardboard to wrap the painting with. So I went down the block to one of the grocery stores which after it closed would put out the empty cardboard boxes to get picked up by the recycling truck. I grabbed a couple only realizing later that they had been used to carry some sort of spicy food or something, as there was a noticeable food odor that emanated from them once I put them in the crate. Monday came, the shipping service picked up the crate. A couple of days later I get a frantic call from the gallery owner where the painting was going asking me what the heck was going on, as they had received a phone call from the shipping service saying the owed several hundred dollars in surchage for the crate because it was so massive. Luckily I'd already been paid for my services. I never heard from them again, obviously though that might have been a good thing since they didn't complain about the food smell that must have come out of the crate when they opened it. I still get this sick feeling in my stomach when I think about this episode. As a rule I generally don't make mistakes. I'm not bragging, in fact it's a bad thing because I spend far too much time over-analysing every last detail, cut and measurement so it would probably be cheaper in the long run to be a bit more speedy and just pay for the mistakes I would make but make more money doing things quicker. Time is money as they say. However, a very rare mistake was when I was hanging a pair of doors in an old house which had original oak door frames that were warped, twisted, out of plumb, etc, etc. The owner (let's be polite here) "had a real eye for detail, so I spent hours planing the oak doors, making sure the gap around the frame was absolutely equal, that the doors closed perfectly flush etc, etc. I re-sealed all the bare edges as a result of the fitting with a lacquer and it was probably the finest example of a perfectly fitted pairs of door in an old frame you've ever seen. Just before I was about to leave the carpet fitters turned up, the home owner asked me if I could hang around for 30 minutes to trim the doors as he didn't want the carpet fitters touching the doors after all the work I'd done, so I obliged. Waited for the carpet fitters to finish, assessed exactly how much needed to be trimmed so there was no gap, but the doors didn't rub against the carpet, marked the cut lines and finally made my cut using my track saw; only to proceed to trim the TOP of the doors instead of the BOTTOM!! Most recent error was when the blade from the utility knife stopped when it hit the bone just below the knuckle of my pointing finger on my right hand. Fixed this one with CA glue instead of sutures. HA ! I figured out if I add a camera (or 3) to my shop and recorded my projects and posted them on Youtube I could edit my mistakes.......therefore I do not make mistakes because I get to edit them out of the projects. I bought walnut from my favorite lumber yard. It's kiln dried, but the warehouse is not heated very well. A few weeks ago I picked up the walnut from a cold warehouse. Brought it into my heated shop and started cutting the walnut to rough sizes and glued up a few panels. Luckily I only had one board move on me and kinda ruined a glued up panel. I was able to mill the ruined glued up from 18mm thick to 12mm thick. So it's not a complete loss. I did have to buy more walnut and make a new 18mm thick panel. My mistake was not letting the walnut acclimate to my shop.......lesson learned.....I had to buy another $130 in walnut. But since I'm recording this build for upcoming Youtube videos.....You guys will never see my mistake ! Gonna go check to see if my CA glue stock is sufficient for wound care. It's been used since the '60's for closing wounds. DermaBond is the name of the FDA medal approved CA. I do keep sutures in my truck, had to sew the tip of a finger back in place once. Tom you never disappoint in terms of knowledge, work or other interesting life events. What the H-E-double hockey sticks man? sew a tip back on? Obviously you must have been using a flat head screwdriver.........those things should be outlawed. Razor knife, across the finger tip. Took the skin and half the nail right off. Had to get the job done so (sew), I put it back in place. It is much easier to use CA than sutures one handed. The common thread , I need to avoid razor knives. When I was 18, I was working for my cousin, he had his own remodeling company. I was installing laminate floor tile in a few apartment rental units he was contracted for remodeling. Me.....a 18 year old kid, 12x12 floor tile, straight edge and a utility knife.....my first experience introducing a blade to my thumb.......so yeah, I kinda know what you're talking about. Except my cousin gave me a role of toilet paper and some duct tape and told me to clean it up. I think I earned a few man points that day, with him at least. Waiting on the Bosch Reaxx to be released . I was up a ladder hanging ceiling drywall onto resilient channel and holding up the sheet with my head and one hand in position ready for my screw gun (yes, I have a drywall lift, but it was easier to manually lift this panel into position). Anywho, the guy helping me was standing below me and I asked him to pass me my drywall screw gun, as I quickly reached down (without looking) with my free hand he'd lifted the gun pointed upright towards me with a screw ready on the tip and the 1-1/4" long drywall screw imbedded FULLY into my forearm muscle! The bugle head of the screw was flush to my skin! Yikes! For a very short moment, he suggested he use the drill to unscrew it from my arm, I said no f'n way of course and then I manually unscrewed it. Strange thing is that I barely bled at all and it hardly hurt. Must of missed all the important veins and arteries and it went straight into muscle. Went to a local medical clinic and the Doc just put on a steri-strip and was back to work in 30 minutes. Didn't need a tetanus shot as I had one a couple of years before. That makes two of us. My birthday is in June, so it could be a nice gift to myself. Guess this thread turned into stories of pain. One time i was holding up some trim and shooting 2" pin nails and the pin bounced off a knot and came back straight through my finger. Happened so fast I pulled away and just saw a tiny red dot on either side of my finger but it HURT like no ones business. My brother in law stapled my foot to a floor with a 7/16" crown x 2" staple. His comment was no big deal, "I took one out of a guys chest last week, just missed his heart" Doc did a very nice job removing the staple from my foot (yes, he's a doctor). In the nineties I was the PM on a large house fire in Vancouver and a BBQ fire had started an outside wall on fire and the fire got up into the attic space and burned up the trusses necessitating the complete removal of the entire roof and trusses. Very little water damage occurred to the residence as the fire dept used foam I think. I had a truss company come out to measure for new trusses. I was being a nice guy and helped the truss guy with measuring the upper wall plate distances as he was by himself. Unfortunately, I was holding the smart end of the tape measure and was calling out the measurements to him. I always double check my measuring, so I know that I was making accurate measurements and shouted them out to him. When the trusses finally arrived they didn't fit. Some were too small and some were too long!!! I know that it was the truss company that screwed up and because it was me that held the smart end of the tape we ended up having to pay their bill!!! They put a lien on house until we paid for the wrong trusses. I had to pay because we received several million dollars a year in losses from the insurer on this loss and we didn't want to rock the boat. Never, ever hold the smart end of the tape for a sub! I ended up ordering new trusses from another truss company and during that wait (2 weeks) a significant microburst storm cell came through the area flooding and filling the temporary tarps we'd put up and then flooding 2 floors of the house completely! The drywall, insulation and hardwoods, etc, etc... Was irreparably damaged. A $100k job just became a $200k plus job. The Insurer did allow the extra costs on the claim, but they were not very happy. Neither was the Homeowner as the job took way longer. One of my workers was using a 1.5" staple gun when he needed to grab something with his gun hand but not wanting to bend over to put the gun on the ground stuck it between his legs with the staple pointed up. Unfortunately he had already pressed the trigger so when the safety clip hit his groin ..... despite the seriousness of the incident the rest of the crew were rolling on the ground in hysterics. I don't know if he ever had any children. When us Canadians get hurt, it fortunately doesn't hurt us in the pocketbook at all when we go to the Doc or hospital for medical needs. Our Medical delivery is publicly funded. Some Provinces have monthly fees under a couple of hundred bucks for a family and ther are no co-pays or deductibles or limits. In my Province of Alberta the Provincial Govt got rid of monthly premiums back in 2009 (we also don't have any Provincial sales tax). Of course we see income taxes. Got everything glued up and let it sit while I moved on to the next task. Came back a little later to admire my work and noticed I installed the front legs backward. Doh! I won't talk about the book case I was building for my son, using dominos, when I assembled it the domino blew out the sides. Made a great shop cabinet though. Ugh. I think you are in the lead with this one. 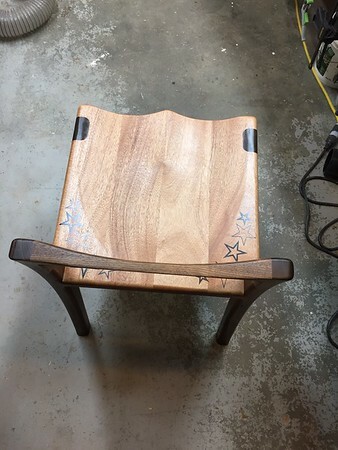 Brilliant joinery on that chair @HMR. If they exist, care to share an in progress pic of how you made that joint between the seat and the leg? @HMR if you hadn't told us no one would know. I think that I prefer the legs that way. 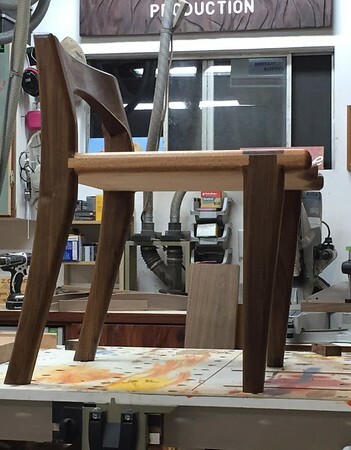 Great looking chairs and I love the leg to seat joint. That's a Maloof leg joint. If you google it you'll get a lot of hits. @HMR that really is a beautiful execution of it. Correct. 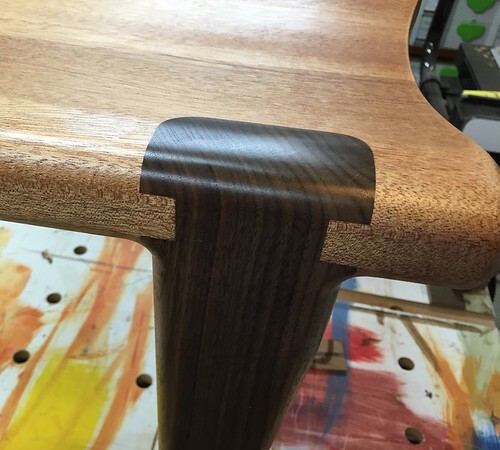 Traditional Maloof joints. Some people do them entirely with a router (there was a great demo of that method on the old TalkFestool message board). 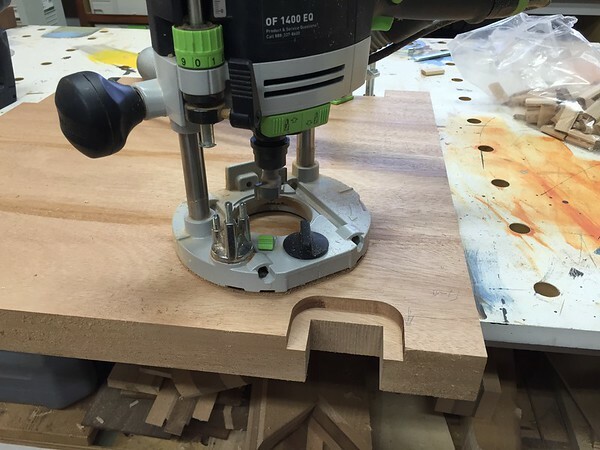 I use a combination of the OF1400 and a tablesaw.